This DVD presents an archived 1991 performance, intended for research purposes, by Carol Téten’s Dance Through Time company. 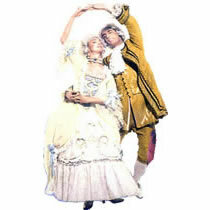 The dancers perform a survey of Baroque dances including Minuets, Allemandes, a Ballo, a Gigue, and much more in period costume. The performance draws from years of research from original sources and archives.